Studying abroad in Israel started sounding like just about the greatest idea when I read Sarah’s post last week about Date Charoset. In Ashkenazi traditions, Passover means no oats or rice in addition to no wheat (except for matzoh). In Sepharic Judaism – what’s practiced in Israel – rice is A-OK. That makes getting through the week easy. But here it’s matzoh, more matzoh, and potatoes. So: skipping past the matzoh, let’s talk about potatoes. Milk-free potatoes. Milk-free mashed potatoes. Wow: I know. These roasted garlic mashed potatoes are kind of revolutionary. In place of the missing dairy, I use garlic confit. Garlic, which is super cheap, gives the potatoes the body and flavor they need. After a couple days of kugel, I think you’ll be ready for a couple days of these yummy, easy mashed potatoes. This recipe is not light on the olive oil. Mashed potatoes crave fat, and since we cut the butter and milk or cream here, we’ve got to replace it with something! If you’re making this dish for a crowd, you’ll have to at least quadruple it. Preheat the oven to 350°F. Put the garlic into a small ovenproof dish with a cover (I use my adorable LeCreuset peppers). Pour olive oil to cover–this will vary depending on the size of your dish–cover, and bake for about 25 minutes, until the oil is sizzling and the garlic is soft but only just barely golden. Remove from the oven. Meanwhile, cut the potatoes into large chunks. 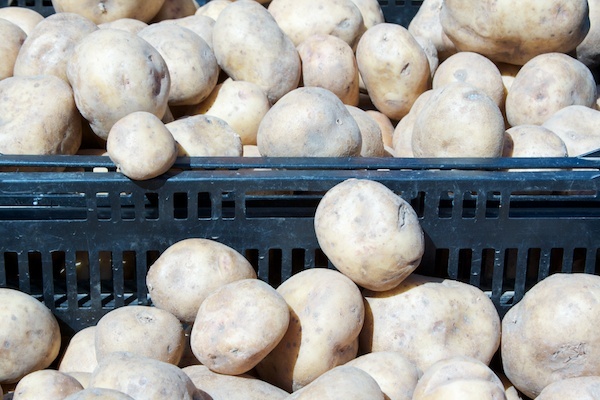 Place them in a medium saucepan and fill with water to cover the potatoes by 1-2 inches. Add 1/2 teaspoon salt and bring to a boil over medium-high heat, then reduce the heat and simmer, uncovered, until the potatoes are very tender, about 20 minutes after the water has boiled. Otherwise, transfer to a serving bowl, garnish with fresh herbs and a grind of black pepper, and serve.